For comfort and durability, the Smooth CE elliptical trainer has a remarkable reputation. It’s known for being nearly silent, virtually problem-free and extremely comfortable. Priced at about $1,500 it’s very affordable considering the quality you’re getting. Porsche contributed to the design of the Smooth CE elliptical trainer, which shouldn’t sway you because of the name but because of Porsche’s reputation for fine German engineering. The magnetic resistance and compact design are both a result of this German engineering, and they are wonderful. This is one of the quietest elliptical machines around, yet it’s compact enough to be used in even a small room. Even more important, the foot pedals are adjustable. You can set them to match the elliptical motion to your height, giving you the proper stride length no matter how tall or short you are. 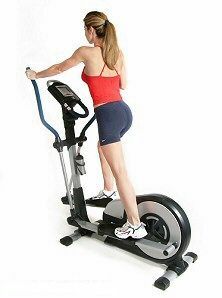 There is no other elliptical trainer made that allows you to adjust stride length to user height. If you’re over six foot tall, you may discover that you haven’t had a truly comfortable elliptical ride until you’ve been on the Smooth CE elliptical trainer. UPDATE: The Smooth CE is no longer being sold. You can check out our list of the best ellipticals $1000-$2000 for a comparable machine. A trainer will tell you that can get a ride nearly as good as that of a Precor when you step on the Smooth CE elliptical machine – and you’ll save at least a thousand dollars at the same time. Fitness pros will also tell you that the adjustable foot pedals make a huge difference, especially when you have multiple users in one home. The trainer’s silent and smooth elliptical orbit is also highly regarded by the experts; in fact, if you have ankle or knee problems, they would recommend the Smooth CE line over any other brand. Buyers of Smooth CE elliptical machines like being protected by a comprehensive warranty – lifetime on the frame, with three years parts and 1 year service. Home users have also been impressed in the last year or so with the vast improvement in the quality of the display console, which Smooth Fitness has upgraded to meet consumer expectations. Smooth Fitness makes elliptical training practically effortless with their magnetic resistance and eddy current braking system. Add in the ability to match the elliptical motion to your actual height and you have what is arguably the most customized fit of any elliptical trainer on the market. An oversized, substantial flywheel and well-made frame mean that this elliptical machine will provide a silky feeling elliptical motion with no wobble at all. In this price range, the Smooth CE elliptical trainer line is an excellent choice for anyone.